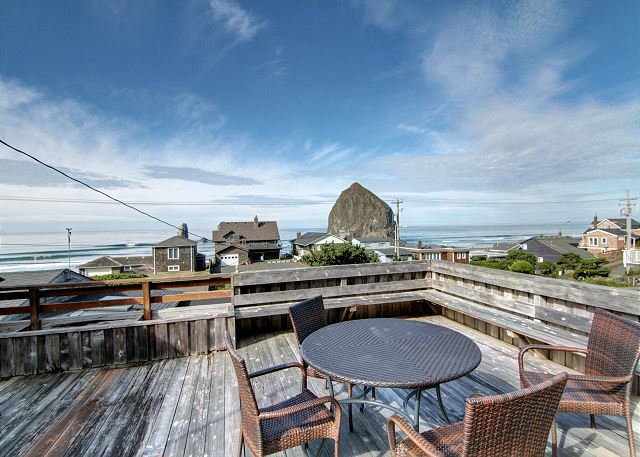 Overlooking iconic Haystack Rock, the Surfshack enjoys some of the best views in Cannon Beach. 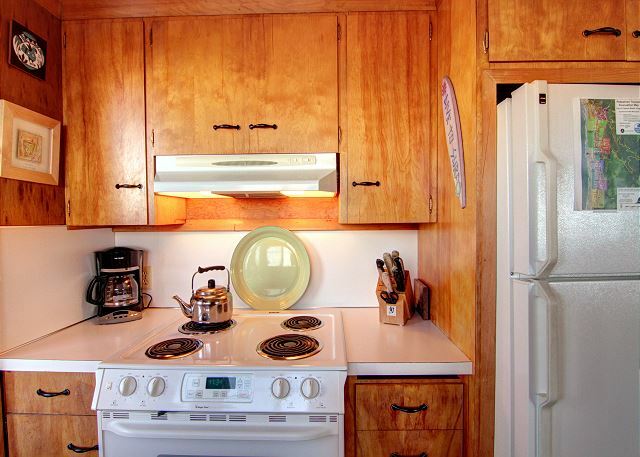 Located at the "curves," this quaint cottage is an ideal getaway for a small family. The decks are the first outstanding feature - surrounding the house they provide breathtaking views. Stepping from the deck to the main entry places you into the cozy kitchen. 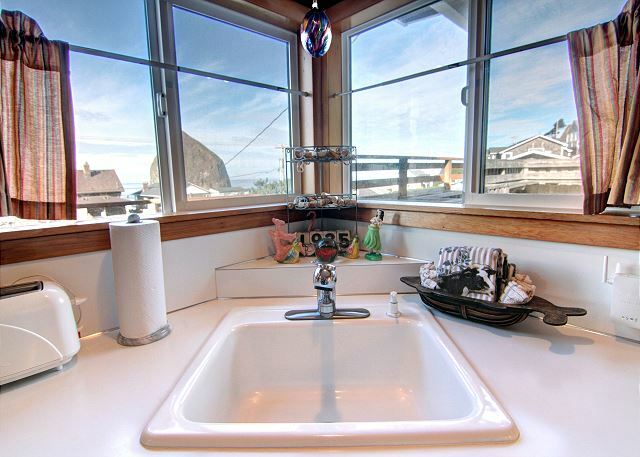 Notice how the counter and charming corner-tucked sink always keep the view in mind. 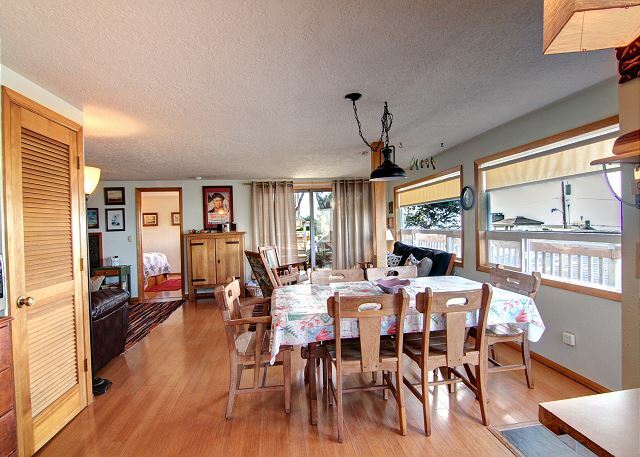 The dining and living areas flow from the kitchen, giving this cottage an open feel. The living room features two seating areas. Enjoy a good book snuggled across from the gas fireplace, or pull out the board games with Haystack always in the background. 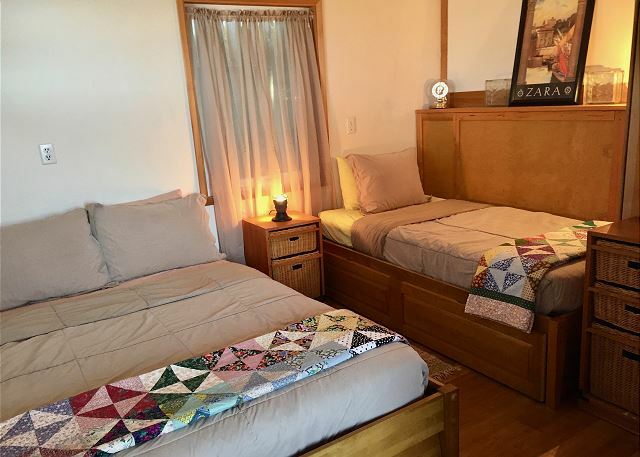 The master bedroom is located off the living room with a Queen bed, while the second bedroom, located off the kitchen, has a Full sized and Twin bed. Across the kitchen area is the bathroom, complete with a shower / tub. 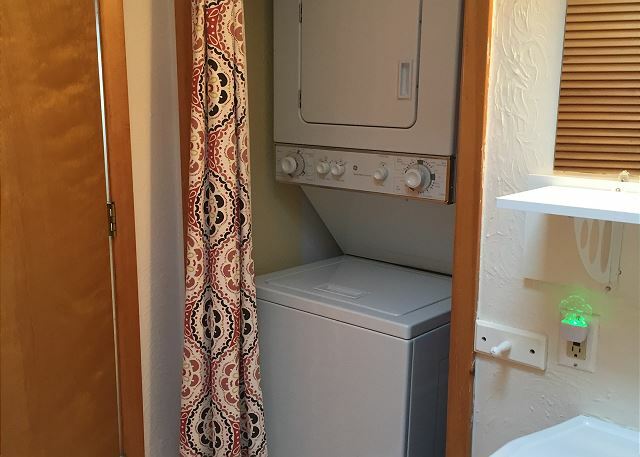 The bathroom also houses the stackable washer and dryer. Accommodates 6 maximum; no smoking; pets welcome; parking for 2 vehicles. 7 night minimum stay during summer months with a Friday arrival date. 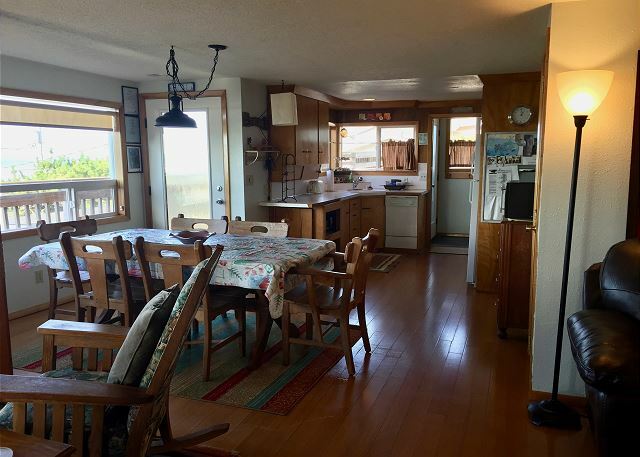 "The home is close to Haystack Rock with convenient beach access. " 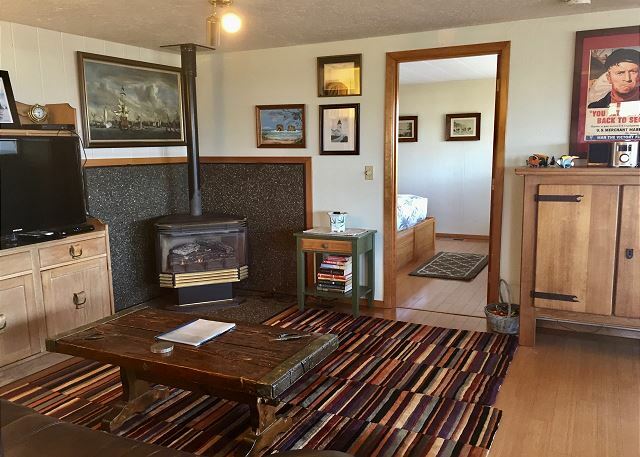 "The home is well equipped and the gas fireplace is very useful on colder days (if visiting in the off season). We found the home comfortable for two adults. The beds in the second bedroom are fairly small (appropriate for children). " "The view and decks at this property are great. The price for ocean view was very reasonable." 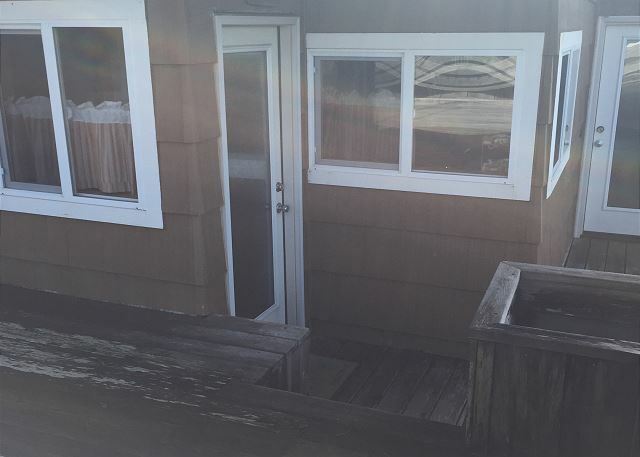 "It may be called a "shack" but it is definitely a very cozy, comfortable place to spend a few days in Cannon Beach. This was our second stay and most likely we would book it again for our party of 4. 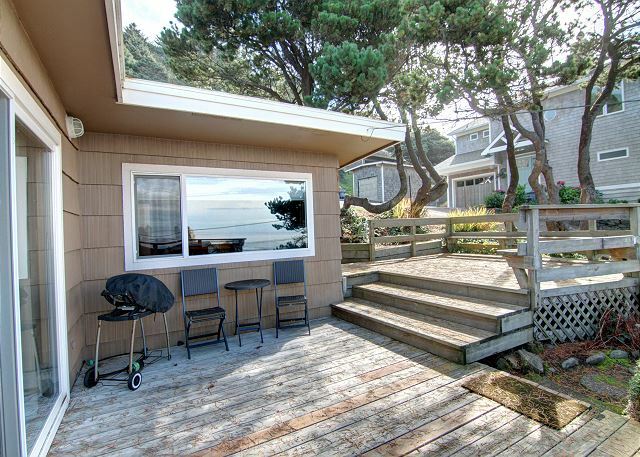 Cannon Beach Property Management makes the entire process easy and hassle free. 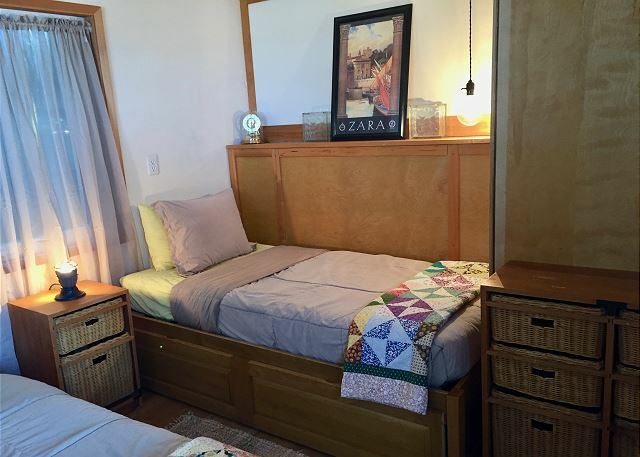 We look forward to exploring their other rentals for our larger gatherings." We are looking forward to your next stay as well. We are open 7 days a week and can help you slect your next house for your next visit! "A very positive experience start to finish. Cannon Beach Property Management was so helpful making the reservation. answering questions on the phone and when we got there. They made the whole process easy. The cottage was great. They had thought of all the little things that make a stay comfortable and homey." "What a great place. It was extremely clean and stocked with all the essentials, including a basket of things for the Dog. Large deck perfect to enjoy the view. Will definetly be back. " "We never had stayed in a rental home before so didn't know what to expect. The second I walked in I loved the house. Great view, comfortable, clean, pretty well outfitted. It's perfect for a couple with children or just a couple. I say that because the master bedroom bed is very comfy but the beds in the second bedroom are not so comfy for an adult. Both are very cute bedrooms. Be prepared to use your own Netflix or Amazon accounts as there are only very basic TV channels. The DVD wasn't working while we were there but the rental office brought a new one so that was helpful. Also a tarp and hose for the car were good to have since the birds in the area are abundant and protected under law. " "This has become an annual destination for our family. The location of the house is perfect for privacy and being in close proximity to everything. Not to mention the view is one of the best in town! "Picked a stormy weekend to visit but so nice to hang out at the surf shack. The gas fireplace was a blessing as we would come back after walking the beach a little chilled. Suggest adding a few spices to the items available for guest use. (aka cinnamon)"
"We have stayed in this house for a few years now and will return again next year. This house is perfect!" "As always, all was in great shape. The shower curtain was pretty musty smelling. However, that no doubt is to be expected at the beach. We always find this a very comfortable rental and would return." "It was ideal--clean, well situated and charmingly decorated, not to mention right next door to our family beach house. We rented on the occasion of our daughter's wedding at Chapman beach on August 22nd, and the groom's family stayed at the surf shack. It was very convenient and festive--easy to retreat if needed but a chance to get to know each other. It was perfect!" "Our third visit to the Surfshack was just as wonderful as always. We had some very minor cleaning issues (almost not worth mentioning but perfection is our goal...lol). We love the new bedroom configuration and furniture and the property manager was as responsive and helpful as always. Beautiful weather in July 2015. This is our favorite vacation house and we will continue to recommend and visit as often as possible." "Fifth year in a row we've stayed there....and for good reason. All pleasure without the pretense. Surfshack gives the perfect Cannon Beach experience." "It was great, beautiful in a wonderful location close to the beach great view." "This place was even cuter in real life than I was expecting. 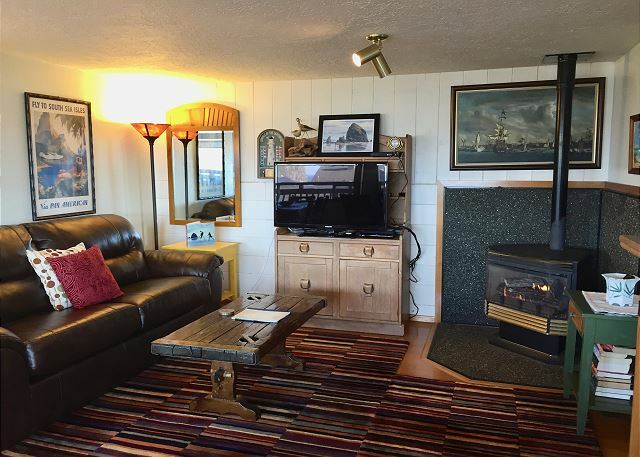 Very cozy and comfortable, great view of Haystack Rock. Wonderful large outdoor deck area and terrific beach access. We will definitely be back!" "We stayed at the Surfshack with our 11 month old lab over the President's day long weekend. The Surfshack has great beach access and views that are unbelievable. Town is within walking distance, especially along the beach. The Surfshack felt like a true beach cottage and had everything you needed. Will definitely stay here again in the future." "Open cozy clean easy walk to the beach, the sound of the wave crashing onto the shore"
"Been coming to the Surf Shack a number of times now and still love it. Nice size for a quiet getaway. Warm and cozy. " "A lovely time---stormy, which I loved as we could stay warm and dry and cozy by the fireplace. Very comfortable and roomy cottage. We loved it all. As technically challenged older folks, we would have appreciated detailed instructions on use of the TV and DVD. Staff was more than helpful, however. " "We have been coming to Cannon Beach for years and staying in a hotel. We decided to try a rental home this time as the price not really much more. 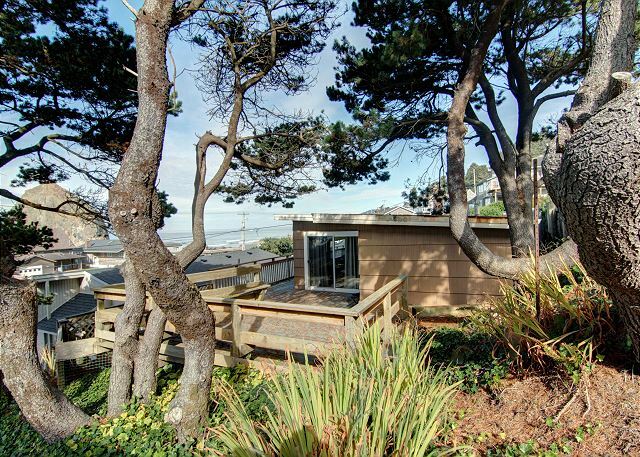 The house was great, just a short path right onto the beach and wonderful ocean views from every window and deck. We can't wait to come back!" "Convenient location for relaxation and fun. View of Haystack and ocean was nice but partially blocked by roof tops. Two decks for lounging. House was very clean and roomy. Very close access to the beach. 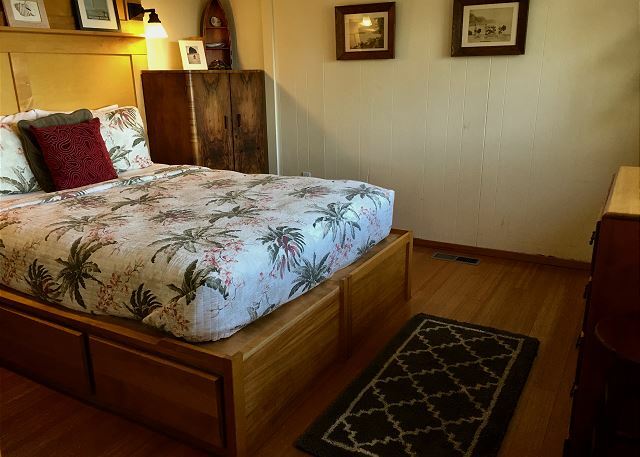 Stay at Surfshack made our trip to visit family and seeing the sights very enjoyable." 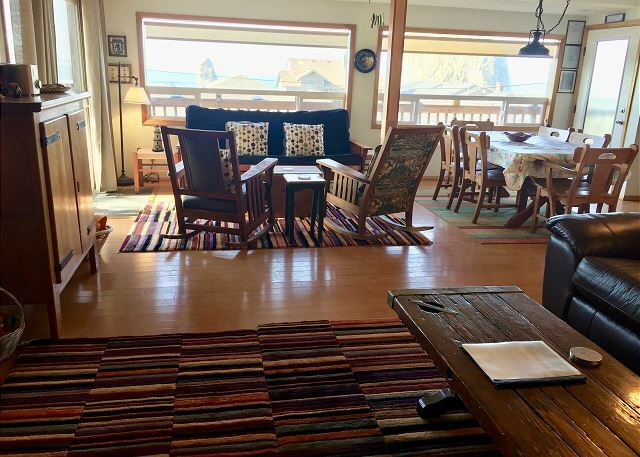 "The location was wonderful--watching birds come and go on Haystack Rock and The Needles from both decks and from the main living rooms in the house was a real treat. House was clean. Only downsides were: not easy to find spots for tiny dogs to do their business; beds were fairly uncomfortable; bird nests in carport were a mess. Couldn't use hose in carport to clean off after beach. Bird poop all over cars and floor. Hard to get in and out. I'm sure the baby birds will be gone soon, but 6 nests right above the cars was pretty significant. " "We stayed three nights at the Surf Shack. Great location, great view. The house was well furnished and very clean...and the deck is huge! Surf Shack is an excellent value for Cannon Beach. The exterior is a bit rugged, but that's why they call it a shack. Plus, it adds character. We would definitely stay here again." "My husband, myself, our 1 year old, and dog all escaped to the surf shack for a beach vacation. The surf shack provided everything we were looking for and more. 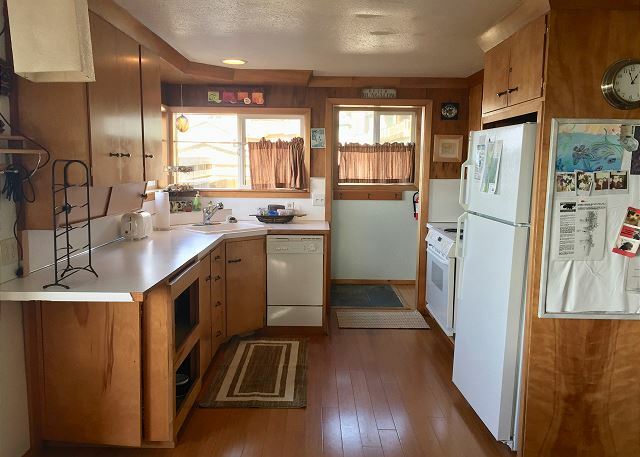 We found the property in great condition, clean, and "move in ready." The location is perfect, could not ask for a better spot to view haystack and the gorgeous ocean." "My wife and one year old son visited Surfshack and had a great time. The location is so close to the beach and to Haystack rock. The location is great! It was great to be able to wake up and walk right down to the tide pools in 2 minutes. We really enjoyed the home like feel of the cabin and the view from both decks is spectacular. Cannon Beach is an incredible beach to visit and I would highly recommend Surfshack and CBPM!!" "This is great. 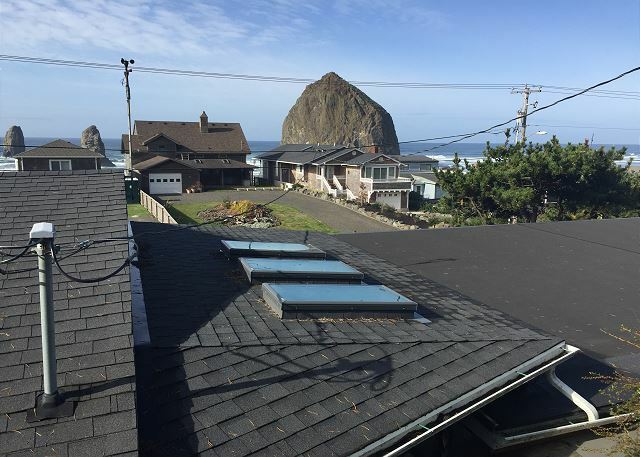 There is a view of the upper part of Haystack Rock and ocean above the rooflines across the street. It is VERY short walk across the little road and down the path to the sand, which is right in front of the Needles/Haystack Rock. The master bed is a full, rather than queen, but that worked fine for us. The other room has a full and a twin and is fairly small. The living room is nice sized but would not work well if there are more than two active kids (or three quieter ones). It worked great with three adults and one child. The games could be updated (Qubic is missing two legs) and there are VHS tapes that don't play on the set. Those should just be removed so people don't waste time with them and get disappointed. Of course there is no obligation to provide movies and games but it is a nice bonus." "Wonderful family vacation with my brother, sister and parents! The weather was perfect and we enjoyed sitting on the large awesome deck...the sunsets were easy to head down to beach from the house...just steps away:-) "
"We had a wonderful time at Cannon Beach. The view of Haystack Rock is amazing from the Surf Shack. Having the choice of decks to lounge on, one sunny another in the shade was great. The path leading to the beach right out the door was convenient. The only negative is the steep & narrow driveway. Probably wouldn't be as much of an issue with a smaller vehicle, but for a full size truck it can be a bit tricky getting in and out. We celebrated our Granddaughter's first birthday, first time at the beach. We will highly consider celebrating her second birthday here or at one of the other properties managed by CBPM. " "We have a great time at Surf Shack. 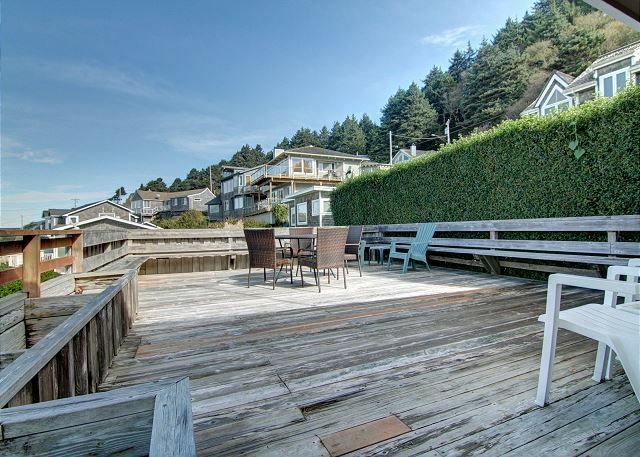 It has two huge decks and great views of haystack rock. The kitchen utensils were good and the bed was comfortable." 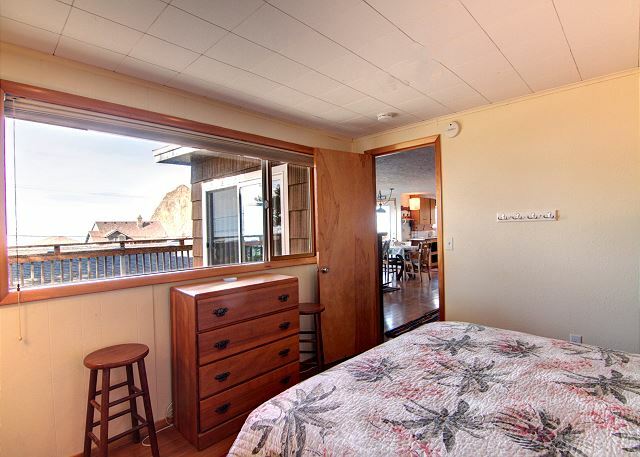 "Surfshack has an amazing view of the beach, ocean and Haystack Rock. You have a view from every room in the house and can hear the ocean even with the windows closed. The house is a cute little house on a dead end street. 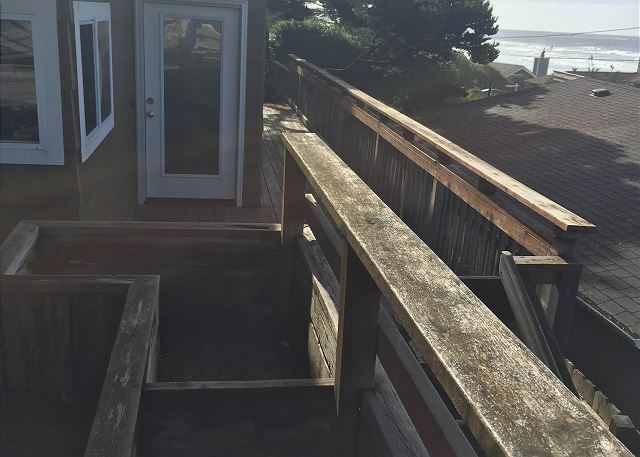 The two decks are perfect for sitting and reading and watching the ocean. There were a couple of boards on the larger deck that need to be replaced. The house is well stocked and well equipped. The mattress on the futon in the living room, though, needs to be replaced - very uncomfortable. Beach access is practically at your doorstep. The beach access is a little steep so that would be something to think about. During the week the neighborhood is very quiet. But, because, beach access takes you directly to Haystack, there is a lot of traffic that pulls onto the street, parks and walks down to the beach. There is also a lot of foot traffic from people parking on Hemlock and walking down to the beach. The neighborhood was much busier on the weekend because of people walking down to Haystack. It's a great location and would definitely consider staying there again. " "Good location, great property, we loved the gas fireplace"
"My two adult daughters and I got away, long time coming. It was a few days we will always remember. Great location and view. Nice personal touch in decorations. We recommend watching their DVD copy of Goonies that was filmed in Cannon Beach and the Oregon Coast. We had great Clam Chowder at Morris' Fireside. We also liked the Wayfarer and Dooger's. We are looking forward to taking a couple of the grandchildren with us next time and stay in the Surfshack. (Linda is the reason we gave property mangement a 5, thanks again)"
"We love the surf shack and always have a wonderful time. Thank you!" "Outstanding view and a great value for a mid-winter break. Home is very cozy and comfortable, clean, and convenient. Only downside was it has a smaller bed in master, and could use a few more kitchen items"
"We experience a strong storm during our stay. Winds were sustained at 50 MPH! It was crazy but we were safe and cozy. We did not lose power and we were glad to be a bit removed from the beach. " "The house was wonderful, just right for us. And the beach access was so close, nice surprise! Only complaint was water very hot in sinks, had to be careful. Otherwise, loved it." 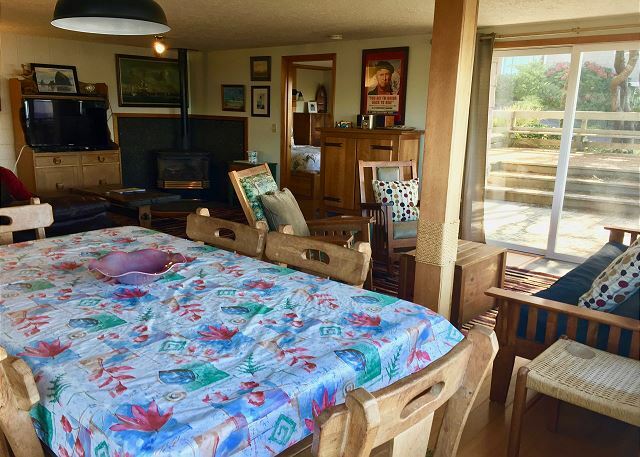 "This is a very comfortable property with a pretty spectacular view of Haystack Rock. This property was perfect for two adults and our 2 small dogs. We had stayed a few times over the years and took the plunge recently for an entire month. It was wonderful." "Already love the beach, so having a great place to stay, great weather, great friends, great food makes this week exceptional." "We love this little cabin and have been here 3 times. It's like coming home every time we visit. It has a very cozy comfortable atmosphere and is well maintained and we want to help keeping it that way. The 2nd bedroom update and placing the w/d in the bathroom were great improvements." "We enjoyed staying at the Surfshack. It was very comfortable and had a nice view of the ocean. We wouldn't hesitate to stay again!" "The entire rental experience was excellent. You cannot ask for a better location for beach access. The home had everything we needed to be comfortable. Thank you for allowing dogs. We had a great mini vacation. " 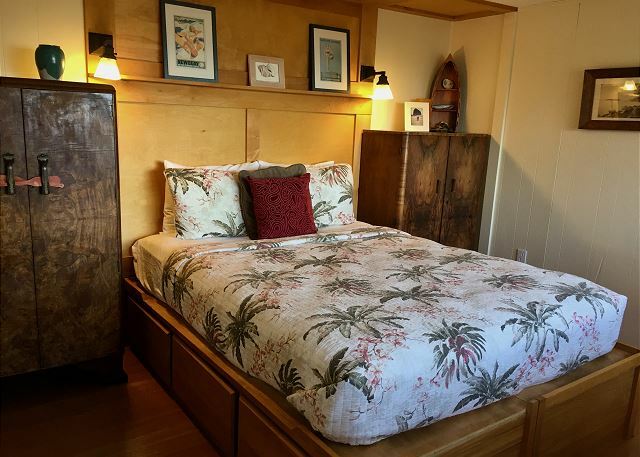 "I've stayed at Surf Shack many times in the many years I've been renting from CBPM. The house sits a row / street above the oceanfront houses and has a great view through the oceanfront houses and telephone wires. There are 2 decks to hang out on which is nice. The owners have updated the home since I was there last which is very nice (still working on some of it I think). There is no grass for your dog to play or do their business so you have to take them for a walk or go to the beach. That wasn't a problem for us with our 2 dogs. The neighbors were very nice and mentioned they were appreciative we weren't using their lawn for the dogs. I've always thought and still do think this house is excellent for the price. I also love seeing the same pictures of the kids on the bulletin board that have been there for 10+ years !!" "I cannot express enough how happy I am with the Property Management, as well as the location we selected. We've stayed there before, and loved it! It's great place, period! The Property Management is quick to respond to anything! highly recommend - hands down! " "Great vista, very homey environment and perfect location." "We loved our stay at the Surf Shack. It is the perfect location and a great place for dogs! The only complaints we had concerned the trouble locating it- better directions would have helped! The wi fi directions were wrong! Beach House pass code isn't correct! It took awhile to figure out it was a Netgear #. The back deck light didn't work so we had to use our flashlight at night. The gas grill needs to be replaced, it was dirty, old and dangerous looking. A plain old charcoal Weber would suffice there. The gasoline can needs to be removed off the deck as well. Other than those minor issues, the place is darling and well kept. Cannon Beach is a beautiful little town and we had a wonderful time staying at the Surf Shack. Hopefully we can return this wonderful environment again." "From the house you have a view of haystack rock. At low tide it was a very easy walk to look at the creatures. Lots of huge deck space." "We had a wonderful Experience the beds were comfy, the Property was clean and had everything we needed. We will be coming back!" "Waking up to the great ocean view each morning was wonderful." "This is our second year renting this property. We plan on renting it annually for our birthdays. Great location all the way around. Beautiful views no matter where you are in the house, plenty of outdoor space for relaxing. It's the perfect space whether there's one of you or 6. " 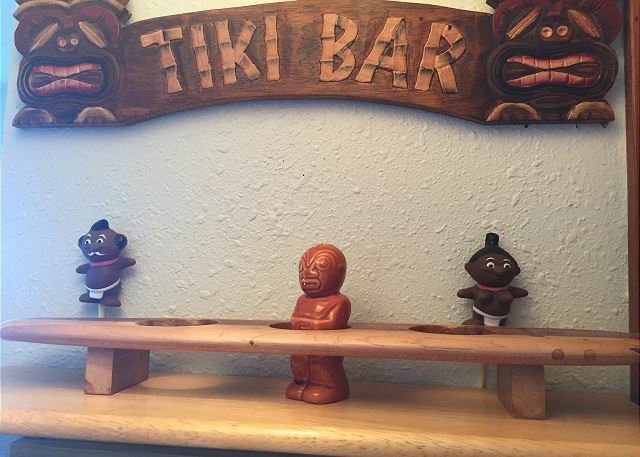 "We thoroughly enjoyed the Surf Shack on MLK weekend. Great floor plan with lots of windows (though best is from upper deck, not house). Easy access to beach, and a quiet neighborhood. Sooo relaxing! " "I stayed at Surf Shack for 3 nights and had amazing weather! The access to the beach is perfect and the views from the windows and deck are amazing. The house is in good shape albeit rustic. There is minimal cooking pots and pans if you like to cook so in the future staying here I would come supplied. The bed was reasonably comfortable. With the windows open you can hear the surf. 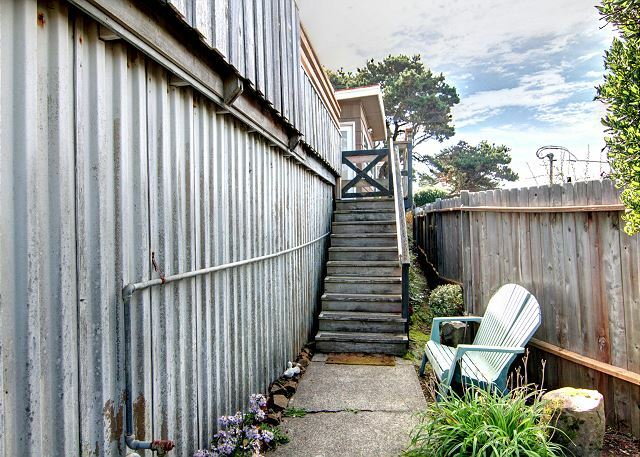 The folks at Cannon Beach Property were very nice and helpful"
"My expectation were low based on the name Surfshack! The views were breathtaking, the location was unbeatable and the value was immense. So comfy, the gas fireplace made it very warm, washer and dryer were so helpful, the path to the beach steps away. Amazing!" "I stayed at a few cbpm homes and surfshack is the best bang for the buck. You get a gorgeous view of haystack and you can even see the lighthouse too. The home is nice as well. There are games, puzzles, and books available at the house. It takes less than two minutes to get to the beach and is a very short drive to town. We always look to book here first." "Overall we had a great time with perfect weather." "We spent two idyllic weeks at the Surf Shack in September for the second year in a row and LOVED it. The home is so comfortable and the location is superb. 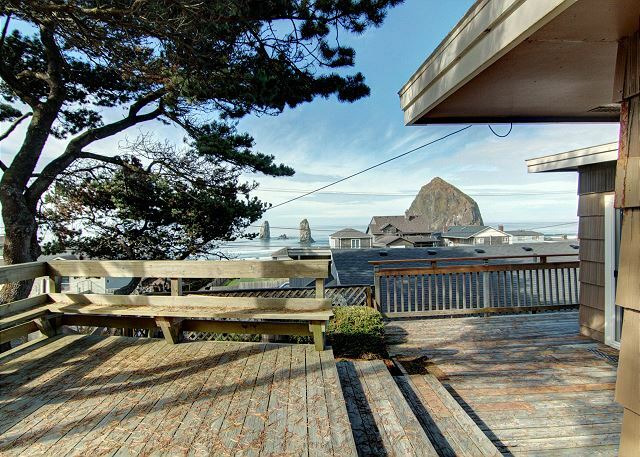 We love the big deck overlooking the magical Haystack Rock and spent many, many hours walking the beach. "we loved our stay, cant wait to go again." 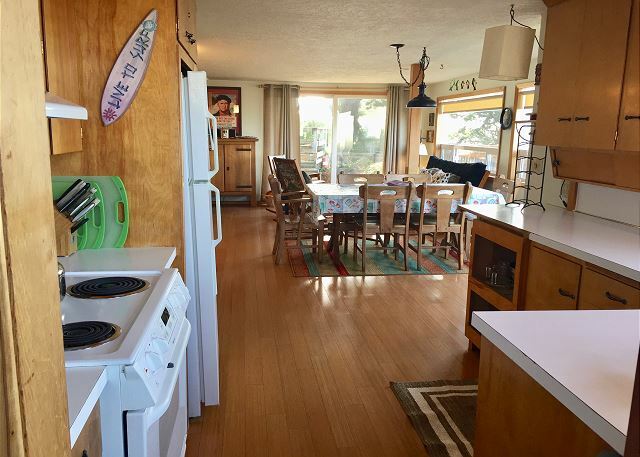 "House was clean and in great proximity to the beach. Only one bathroom but otherwise good use of space." "We had a great time staying at the Surf Shack. It was very clean inside and comfortable. It was a short walking distance to the beach. The deck was wonderful to sit and relax while reading a good book or just looking at the view of the beach and Haystack Rock. The location was great...not too far from town. " "We had a great time andyour company was more than accommodating. We definately will be back. My says it's her new best place to visit." "This was a perfect place for our family and friends to stay. Beautiful view and lucked out with beautiful weather. Will be staying here again. Hopefully soon!" "Nothing fancy but the Surf Shack is where my family will stay again and again when we visit the coast. The price and location could not be beat. CBPM was just awesome to deal with. The Surf Shack itself is vintage but it works. The only complaints we had were small; some glasses weren't clean, the generic laundry soap gave my son and I a rash (but we have sensitive skin - the laundry detergent wasn't labelled so it was a risk and we knew it.) The important things like the couches, the chairs, the big main bed - just fantastic. And the kitchen table - what a view! Drinking coffee there every morning was just wonderful. Thank you!" 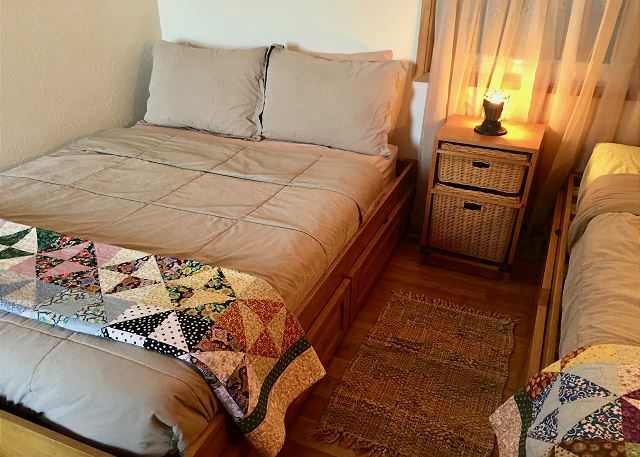 "My family and I found this vacation rental house cozy and comfortable. 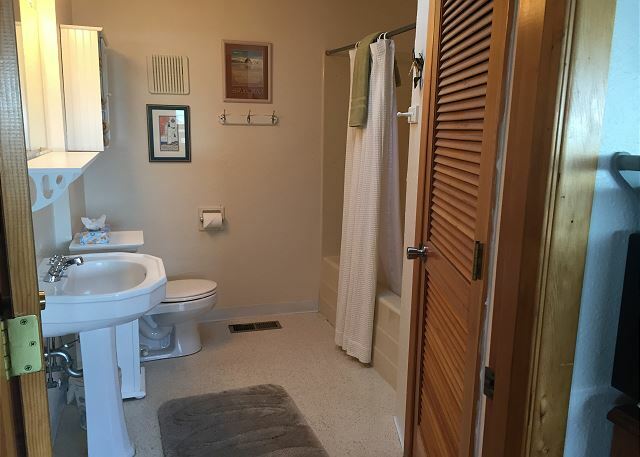 Even though this rental only had one bathroom, it suited a family of four well. We enjoyed the view of Haystack Rock, watching the storm clouds roll in, and also enjoyed listening to the roar of the waves. It was such a convienent little house, within close proximity to the beach. In the morning, I would take my little boy to the tidepools at the foot of Haystack, which was literally, a simple jaunt away. My family loved that this rental was just a short distance away from the simple ammenities of Cannon Beach, and the house provided a quite, serene location, which served my family well. We hope to return." "Fabulous location!! Wonderful view!! Would go back again, only in the summer this time! But what a wonderful place to experiance a true winter storm!!! Stayed nice and warm with the fire going!! Loved it!! Oh, next time I will pack a blow dryer! Other then that everything we needed was there!!!! M-"
"The Surfshack is really cute & clean and has an amazing view. It is a very short walk to the beach and Haystack Rock. We loved it & would recommend it to anyone looking for an affordable vacation rental in Cannon Beach." "First time at Surfshack and we would definitely recommend it. Awesome view of Haystack Rock. There were 5 of us plus baby and it was a good fit- had everything we needed." "My daughter, dog, and I spent a relaxing week at this wonderful beach house. We will definitely be back!" "We had a perfect stay at the surf shack! Mom, daughter, and sister getaway. Only complaint would be the smell in the bedroom. They said they had just painted, but it smelled stronger than paint. The place was very open and actually roomier than we expected." "Fun stay and more than adaquate amenities. We had two adults and two young children and it fit us great. "Very clean. Great location. Great price as well. Loved it but needs a tea pot. " "Great location... cozy property. We satyed 3 nights and really enjoyed the place. It is convenient to the town center but not too close. Great access tothe beach as well." "My wife and I have been coming to Cannon Beach since the 1970s. This is the first time we have stayed at the Surf Shack and we were not disappointed in the least. This place is not furnished for yuppies and the price reflects that. This is truly a value. When you come to Cannon Beach you come for the coast and the view. And the view at Cannon Beach is defined by Haystack Rock. The view from the Surf Shack puts Haystack right in your lap. The place is clean and furnished with what seems to be 1970s garage sale kitsch. But it is all clean and functional. Great windows, great view, great decks. "The Surf Shack at Cannon Beach is a must stay for any traveler looking for peaceful surroundings with a great view of the ocean. The access to the beach is second to none! This quaint little cottage is just what a couple needs for a romantic getaway. It's perfect for the fatigued business person who just needs some peace and ocean breeze. You will come away refreshed and renewed after your stay at The Surf Shack!" "I rented the Surf Shack strictly on the basis of location, as we wanted that spectacular view of Haystack and The Needles. For the very reasonable price we paid, we really expected something small and quite rustic. However, we were VERY pleasantly surprised! The house was wonderful! The only small complaint we had was that the futon in front of the tv isn't too comfortable, in fact, it's kind of a backbreaker. That's certainly not an issue, though, as tv isn't a big priority in that setting, and the other couch (from which the tv is also visible) is very comfortable. "We LOVED the Surfshack. The deck was huge and private with an amazing view! The location was far enough from the larger resort hotels so we could avoid the crowds yet an easy walk into town. We had a GREAT time there!!" "your stars didn't show up on my screen at first"
"Perfect for a family to kick back and enjoy Haystack rock with just a short stroll down the stairs." "Location of rental property was perfect for the various areas/activities we enjoyed while in the northern, coastal area of Oregon. This home was a great place to base ourselves." "We just spend 3 wonderful nites in the Surfshack and LOVED it and LOVED the location and easy beach access. I have been to Cannon Beach at least 20 times and this will be the place we return to." "As a youngster through adulthood I would stay with my grandparents in Cannon Beach and enjoy its ambvieance. It was nice to come home." "except the blower on the gas fireplace only runs on high speed and not on low. Hey, as I said, everything was as advertised. Clean house, clean towels, bed sheets and refrigerator. Too cool. 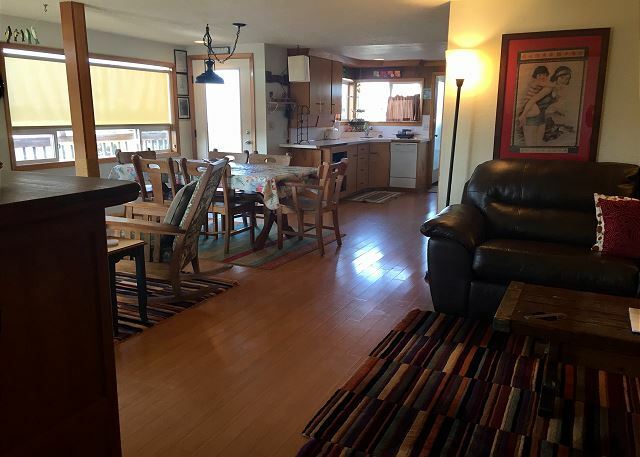 Thanks,"
"We love the setup of the cabin - the huge picture window is made us very happy even during the storms...the newly updated floors are excellent- we could walk barefoot -they always felt warm and clean...the kitchen is perfect; my husband and i each claimed a couch; this is the 3rd prop. we have stayed at (a couple of stays at the Beach Bijou way back; one time at the Aldoren's ; this is our favorite and would love to come back as much as we could afford it:)"